The program fee cost stated above covers the following services rendered by Patriots Ghana to you. The first month is more as it incurs extra one-time costs, such as the airport transfers and the orientation transportation and tours on the first three days of arrival. NB: Some institutions require the contribution of an additional fee to cover the extra learning and training costs related to the internship for them; this cost will depend on each institution and it will be from $100 to $400. THIS ONLY APPLIES TO INTERNSHIP PROGRAMS. Cost of living depends on individual choice and lifestyle! On a general budget we advise that you come with an additional US$50-100 a week to cater for your personal needs such as lunch, phone credit, transportation, snacks, entertainment, drinks and excursions if preferred, and any other things you may wish to buy. If you are short of funds, fundraising is a common way to help raise money to pay for the program fee. This can be easily done by actively seeking donations from private enterprises, local companies or organizations to help fund your placement. You can try to apply for funding at your university or grant proposals to charitable organizations such as The Prince’s Trust. Attempt appeals to friends and family in person, and also on the internet or facebook for example. Promote awareness within the media, and you can look at organizing community events; from charity gigs, parties, marathons, raffles, bingo, cake sales – you name it and previous volunteers have raised it! 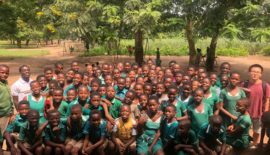 All of these fundraising techniques will help people to contribute to the cause of helping the needy communities in Ghana. 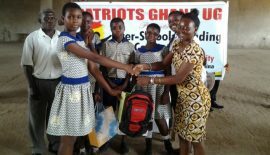 Patriots Ghana is happy to provide you with a letter you can send to organizations to prove your commitment as a volunteer or intern. Our tips when writing to potential donors, is not to write too much information, be concise and to the point about your desires for them to aid in a good cause. It’s a good idea to state a specific amount of money you are requesting and the total you are hoping to raise. Express a sense of urgency to get a prompt reply. Be sure to acknowledge all contributors with a thank you letter, and give a presentation with photos to them after your experience to show how their money has made a positive impact on the developing world. With regards to online donations, feel free to contact us as we would be happy to assist you in any way we can, i.e. Facebook interaction.etc. Should you require any help with your fundraising efforts, please don’t hesitate to contact us as we would be happy to assist.